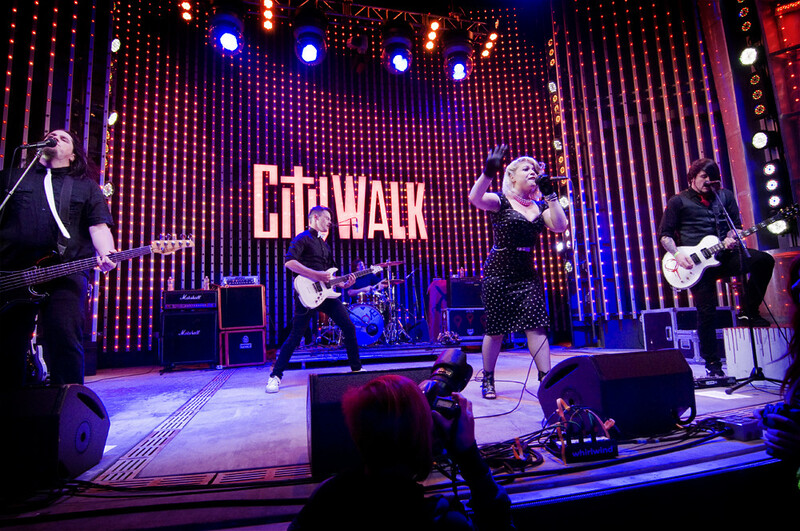 Cherri Bomb (L-R: Miranda Miller, Julia Pierce, Nia Lovelis & Rena Lovelis) performs at Universal CityWalk's 5 Towers Music Spotlight Series. 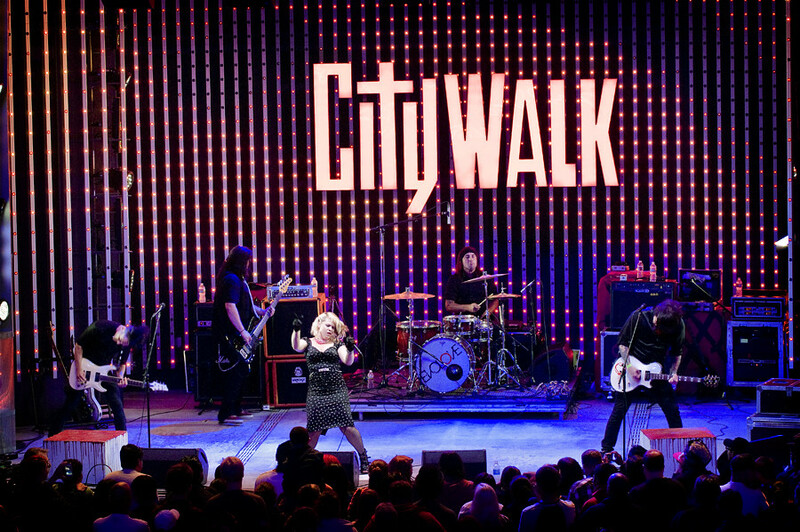 It was the second weekend in a row that the 5 Towers concert stage drew me to Universal’s CityWalk. Two weeks ago, it was Canadian pop singer Carly Rae Jepsen. 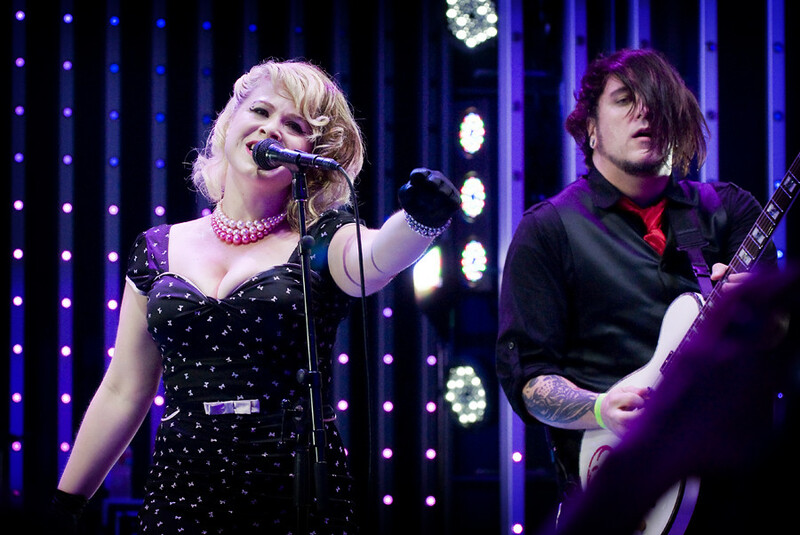 And last week it was a double-billing of local bands Evolove and Cherri Bomb who took the stage as part of the April Music Spotlight Series, featuring special performances by some of pop and rock’s hottest debut artists. The 5 Towers is one of the largest free venues in the country, boasting state-of-the-art jaw-dropping sights and sounds. 5,000 LED lights encompass the 31 x 24-foot stage that features five 42-foot LED light-towers and to make sure there isn't a bad seat in the house, a large 26-foot monitor is mounted above the stage for all to see. 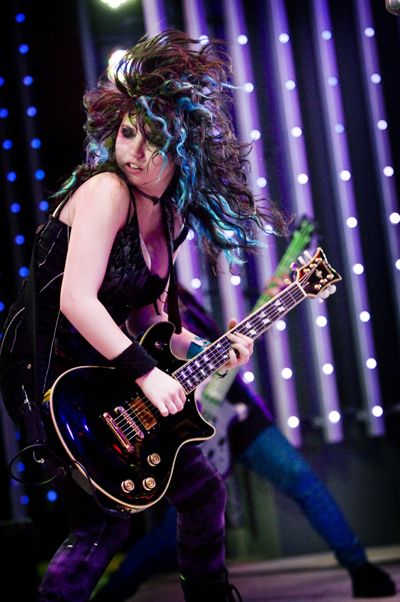 Commanding performance delivered over head-banging tempos and shredding guitars, Cherri Bomb are past the point of trying to prove themselves. 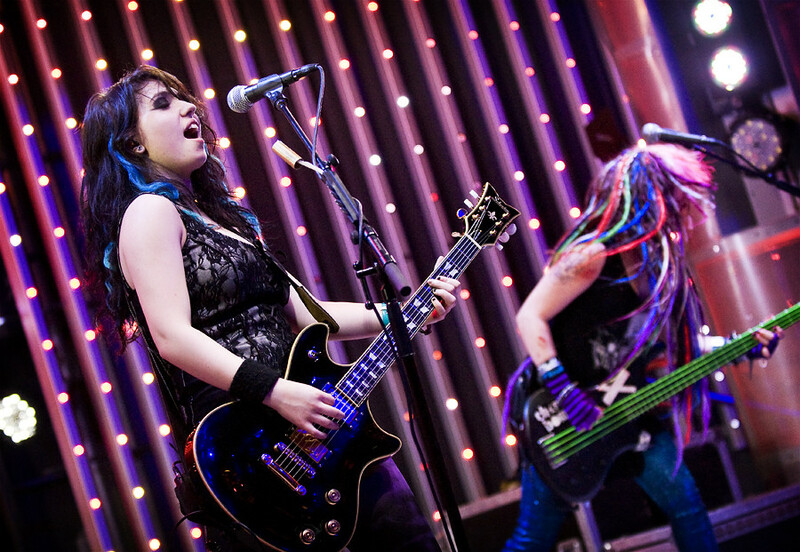 No longer a mere curiosity act, Cherri Bomb are now creating buzz for their music rather than their youthfulness. 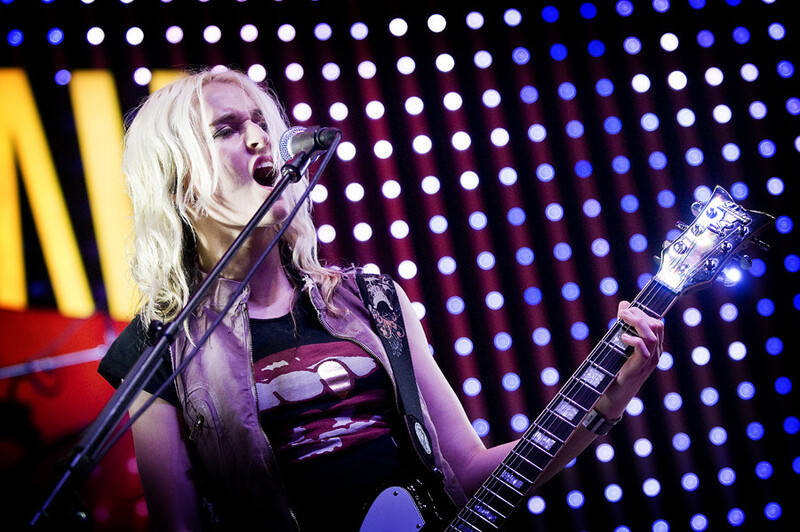 This year may be the break out year for Cherri Bomb, the Los Angeles quartet who have just announced they'll be performing on this year’s Warped Tour. Already seasoned tour veterans, in their short career, they've already shared the stage with the likes of Foo Fighters, Filter and Smashing Pumpkins and have also played some of the top music festivals in the world including Sunset Strip Music Festival, Reading Festival, Leeds Festival, SXSW and the upcoming Bamboozle. This summer, their single "Shake the Ground" is going to be appearing on Marvel's The Avengers soundtrack alongside Soundgarden, Bush and Scott Weiland of Stone Temple Pilots. 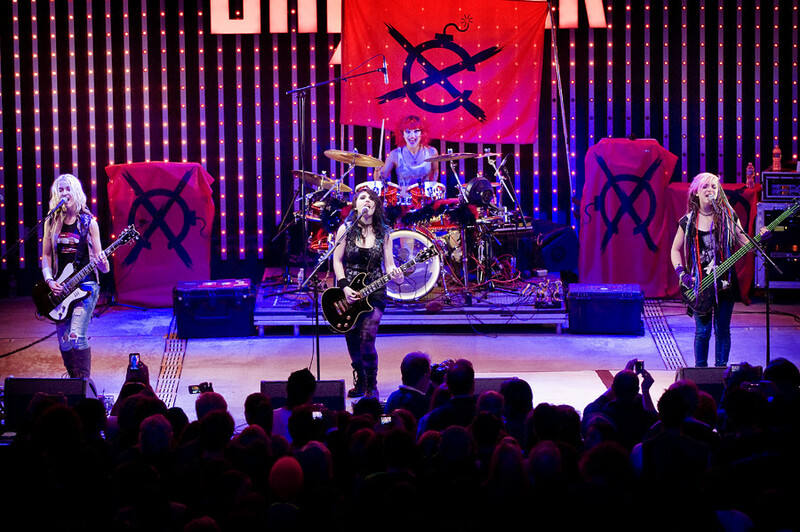 And next month, on May 15th, Cherri Bomb releases their debut album "The End of Control." Not bad for the band considering they're not even old enough to drink yet. Earlier in the night, Evolove, the five-piece band fronted by Lucy Levinsohn showed why they're one of the best live acts in town. And unlike the constrained stage of smaller venues, the openness of CityWalk's 5 Towers suits the pop-core band's arena-ready songs. But the heart of the band shines in their vulnerable melodies. When they tone it down in songs like "Four Walls " and "Let Me In" you get to see that this band is more than just a hard-pop-core band. They have range and can veer from electric-power-guitar-assault to soft-acoustic-strumming. Maybe that's why they're readying future acoustic shows just in time to promote the release of their upcoming acoustic called Acoustic Sessions Vol. 1. But until then, you can catch Evolove when they next perform at The Roxy May 7th with Lacey Conner and We Are The Riot.